After doing his Bachelor in Design of Visual Communication and his Masters Degree of Creative Marketing from BINUS International, he found himself a job. Like most of us, he soon felt an urge that there must be more beyond the everyday life he was living. And one day, he actually decided to do something about it. Two weeks ago Christine Gneuss, lecturer in BINUS International, had a meeting with this young graduate, who wanted some advice on the #DrawDreaming ‘project’ he was working on. 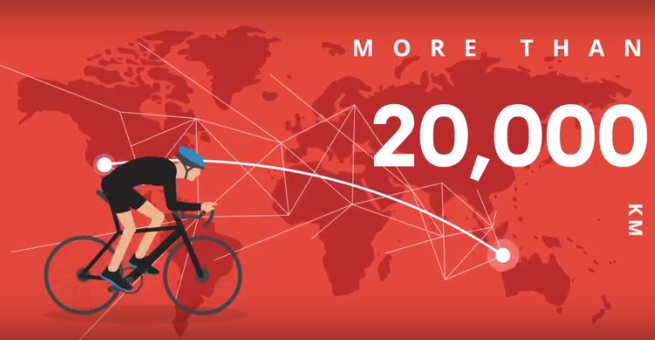 His mission – To cycle from Jakarta to San Francisco, visit schools and volunteer his time to draw with children from every country along the way to draw their own dreams. The bighearted cycling fan loves working with kids and his graphic design background lends itself to guide children to draw their innermost wishes. Andrew’s route*: Indonesia, Singapore, Malaysia, Thailand, Laos, China, Nepal, India, Pakistan, Iran, Turkey, Yemen, Italy, France, Belgium, Netherlands, UK, Iceland, Canada, US. You can follow Andrew’s exact position and route on his website. Feel curious and want to know more? Click here.